In their first book, Take A Hike Louisville!, author Lucynda Koesters and her husband, Willi, asked the question, "Why should anyone want to take a hike?" They pointed out that no matter what age or stage of life a person is in, everyone can enjoy substantial mental and physical benefits from getting out and enjoying nature. Still, they found that as one "ages gracefully," hikes can become more strenuous and harder to take on. 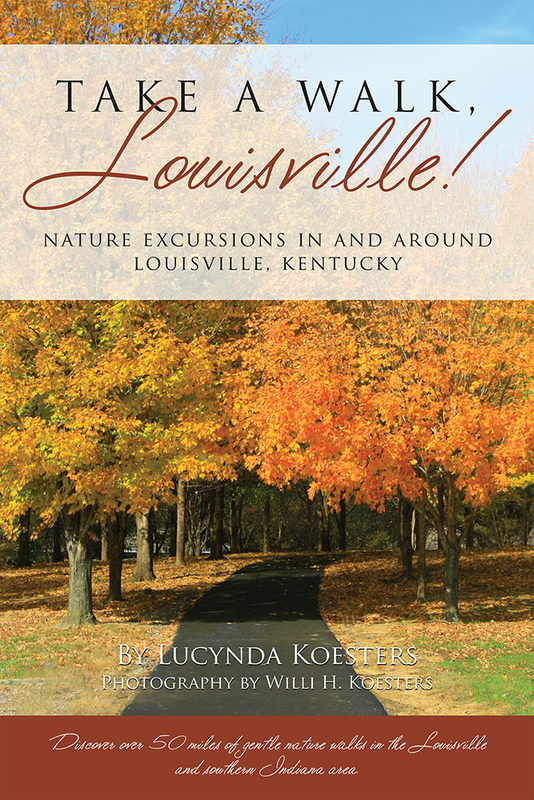 So, knowing the physical benefits of simply walking a little each day, combined with the mental and spiritual boosts one gets just by being in nature, the Koesters aimed to present a walking guide to Louisville-area nature paths and "gentle" hikes. Take A Walk, Louisville! is that guide. Here, the Koesters have scoped out more than 25 new walks for you to explore and enjoy. Most have paved walkways with gentle inclines. A few are hiking trails or grassy paths. As with their previous collection, the Koesters have found that an abundance of wonderful and easily accessible nature areas exist right here in our own Louisville backyard. Walking benefits one's body and spirit. It is inexpensive, convenient, and enjoyable, and coupled with the fresh air and scenery of nature, it can be mood elevating as well. Walking puts less stress on older bodies than most other forms of exercise, but offers many of the same health-boosting benefits. Lucynda Koesters met her husband, Willi, in the 1980s when they both worked for a Louisville advertising agency. They spent much time in nature in their early years hiking and camping together. Children, careers, and sports intervened in the middle years, making it harder to find time for outdoor excursions, but the love of nature had taken hold. Now, with two adult children and a preteen, the family makes it a priority once again to get out and enjoy nature walks whenever possible. Willi and Lucynda's first book together, Take A Hike, Louisville!, published by Butler Books in 2009, was a family project and local favorite. Take A Walk, Louisville! is their answer to the challenges of outdoor adventures as one ages, has small children in tow, or is caregiving for an elderly or able-challenged person. Lucynda is currently the director of Nutrition and Senior Centers for LifeSpan Resources, Inc., the Area Agency on Aging for Clark, Floyd, Harrison, and Scott Counties, Indiana. Willi is enjoying his �encore� career as an engineering technician at Amatrol, Inc., in Jeffersonville, Indiana. His photography these days is of his personal favorite work: nature, landscapes, and family. Gracie, the Koesters' youngest child, and constant hiking and walking companion, is now a preteen. She loves school, reading, art, and taking nature walks with Mom and Dad. She walked all but one of the walks in this book. The family feels truly blessed.